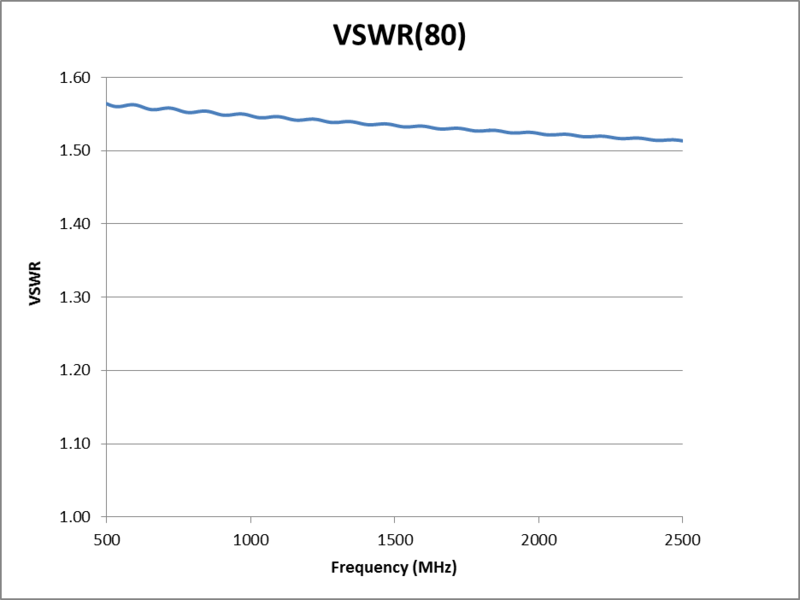 The first point is that the lower plot is not Return Loss (IEEE 1988), nor is it SWR, because Return Loss is never negative. It is probably ρ, the magnitude of the complex reflection coefficient, expressed in deciBels. Additionally, SWR is a function of ρ, but it is not equivalent to ρ. The next point is that it is most unlikely to be approximately 5m in length. 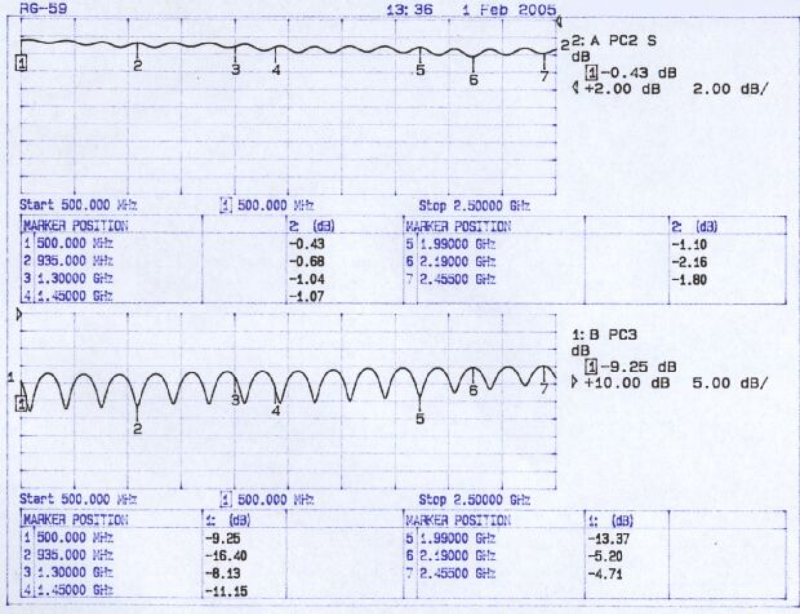 Above is a scan of the 5m scenario with 1000 data points to demonstrate that it is unlikely that the scenario described by VK2XSO was ~5m of RG59. 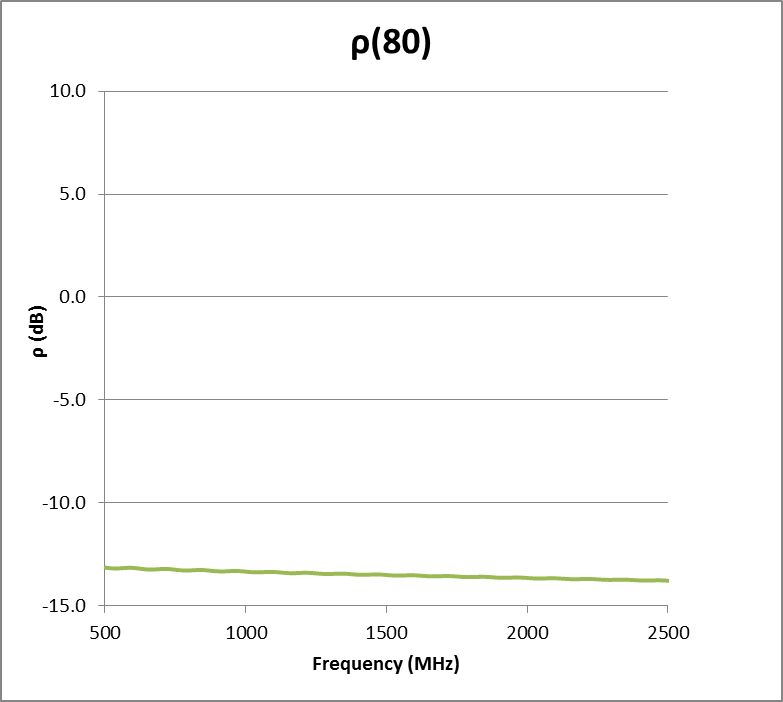 The minima of ρ are approximately 130MHz apart. 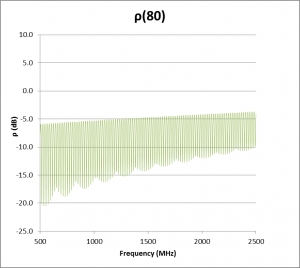 If a sweep was taken from DC, there would be a local ρ minimum at 0Hz, the fourth at about 500MHz, and the marker at 5 (1990MHz) would be the 15th, so the average spacing would be 1990/15=132.7MHz. These minima occur at frequencies where the line is an integral multiple of an electrical half wave in length, so that implies that the line is 1.13m in electrical length or 0.757m physical length taking into account the velocity factor of regular RG59. Above, a simulation with the length adjusted slightly to 0.79m to get the best reconciliation at the top end. 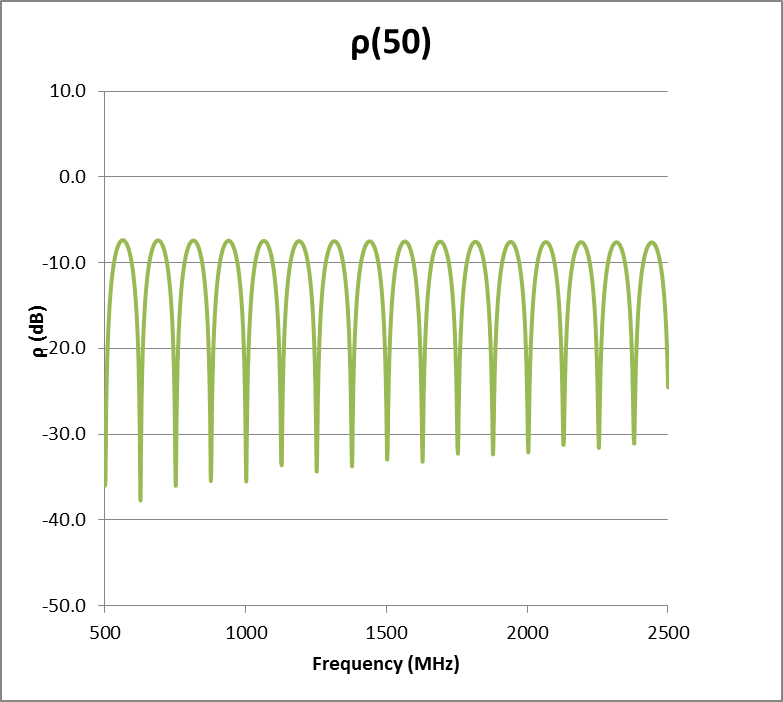 This is ρ wrt 50Ω, and it is meaningful in expressing the mismatch at the instrument interface, but it doesn’t directly give ρ or VSWR on the cable. 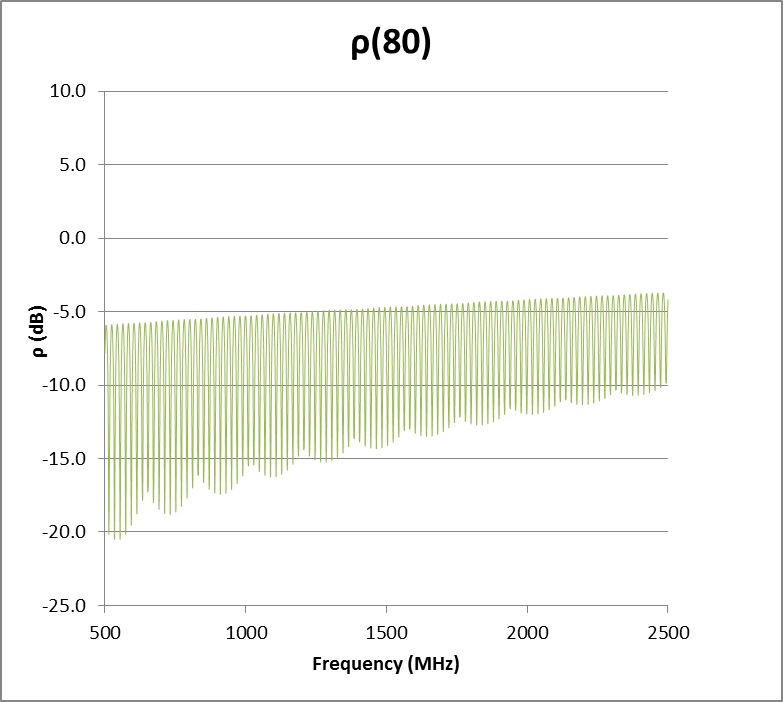 To calibrate this model to VK2XSO’s plot, the nominal Zo of the line section was increased to obtain the maximum values of ρ of about -7.2dB, indicating that the actual cable tested was slightly high in Zo (ρ(50)=-7.2dB, VSWR(50)=2.55, Zo=2.55^0.5*50=79.84Ω). 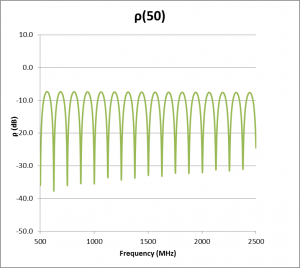 With nominal Zo of 80Ω and loss profile similar to RG59, the actual Zo varies with frequency, and for example, it is 80-j0.12Ω at 500Mhz. 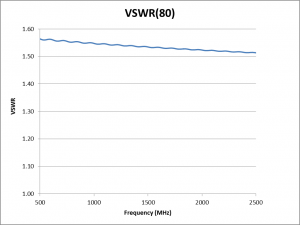 Let us calculate ρ and VSWR wrt 80Ω, it will be very close to the actual ρ and VSWR. Not exactly, but very close. Above is ρ wrt 80Ω, this is what the instrument would indicate if it were using 80Ω as the reference impedance. 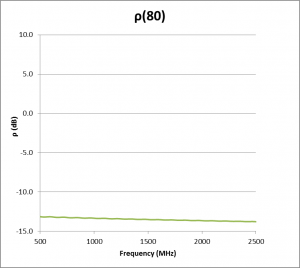 Note that there is a very small ripple which is due to the error between nominal Zo of 80Ω and actual Zo at each frequency, and the line trends down to the right as increasing attenuation with frequency decreases ρ. Above, the same thing expressed as VSWR(80). Same observations obviously as VSWR is a function of ρ (VSWR=(1+ρ)/(1-ρ)). 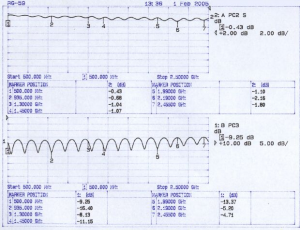 So the actual standing wave on the coax is nothing like implied by the instrument plot as the reference impedance used for the instrument plot is different to the coax and not directly applicable to it. Transmission lines are such interesting things. IEEE. 1988. IEEE standard dictionary of electrical and electronic terms, IEEE Press, 4th Edition, 1988.